Those inclined to irony might find it in the Palo Alto Farmers Market assembled on asphalt, where there had once been an apricot orchard. Each weekend from May through December, the workweek parking lot filled with vendor stands and umbrellas protecting bins of trucked-in garlic cloves, avocados, tomatillos, et al. The University down the street was known as “The Farm,” though it hadn’t been one since the Stanfords donated their country estate and chartered a college in the 1880s. Stanford grads and especially its dropouts had been transforming the Valley ever since; the fruit came from further and further away. It's really hard to grab a representative quotation from this novel -- but this comes close. There's a hint of the humor, the capturing of a moment in time, societal observation, a hint of wistfulness, and even a modicum of critique. It's 2002, in many parts of the country the shadow of 9/11 looms large. It's present in Palo Alto, but not to the degree it is other places -- what looms larger is the bursting of the dot-com bubble, everyone around them has been impacted in some way by it -- most people have been impacted in significant ways, although the ripples are still going out from them and affecting the lives of everyone in their community in some way. Our focus in this novel is on the life of Chad Loudermilk and those who are near him. Chad's 14 and is enduring his first year in high school. His best friend since . . . well, forever, Walter Chen attended there briefly, but was pulled out by his parents to attend the Roman Catholic academy nearby -- for a greater focus on academics, and fewer active shooter drills. Life's hard without Walter around. Chad's mother works with "at risk" youth, on making wise decisions, while she's still reeling from her mother's death a few months earlier. Chad's father, Ray, is dealing with ripples of the burst -- the advertising agency he's part of his dealing with a shift in clientele. There's Scot, Chad's next-door neighbor, the creator of Latte (wink, wink) -- the Macromedia tool -- a big brother figure, dispensing non-parental advice and playing video games (his wife really doesn't have any time for Chad). There's a new girl in school that Chad can't stop talking about, and a couple of guys from the proverbial other side of the tracks that he met at a record store and is spending time with. The major focus of the plot is following Chad's interactions with them over the course of a few months -- we get chapters focusing on his parents and what's going on in their lives, but on the whole, the rest of the characters are seen filtered through Chad's experience. The other major thread follows Chad's maternal aunt, Diana, a physics professor we meet as she registers for a conference in Barcelona. She's trying to re-establish her career after pressing pause on things to have a child with her best friend. It's not easy for her to get back into the swing of things, but she's close. As Chad's aunt, there's a lot of opportunity for the plotlines to intersect and overlap -- but the sisters aren't that close, so it's not as frequent as it could've been. By the end of the novel, events have transpired enough that Diana's as large a fixture in Chad's life as Scot (maybe larger), so it's easy to intermingle the story lines. But for the first 1/2-2/3 or so, there a clear distinction between the two -- and it's not clear why we're getting both stories. Another thing that's not clear is what exactly is Chad's story. This is close to a Bildungsroman, but we only really see the beginning of Chad's development -- it's like the first Act of Chad's Bildungsroman. Which isn't to say that it's an incomplete story, it's not. It's just about Chad starting adolescence. You don't want to get the details from me, you want to get them from the book, but a lot of stuff happens. Nothing major like a school shooting, a terrorist attack, or anything. Just life, the ebbs and flows of people's lives. I could actually sum up the major events of the novel in 2 sentences. One of them might be long-ish, but just two sentences. Don't get me wrong -- there's a plot to this book. But really, you don't see it (well, I didn't see it) until toward the end -- maybe even after the end. This is not a bad thing, it just means you have to think about things a lot. My notes are filled with comments along the lines of "I really don't see where this is going" or "I'm not sure what the point of all this is" -- and they're always followed with, "Don't care, great stuff." I really didn't care where Rossmann was going, I was too busy enjoying the ride -- the voice, the characters, the atmosphere, the little bits like the Farmers Market (above), were enough to keep me engaged, entertained and turning the pages. I'm not going to drill down and talk about the various characters -- or even just one. I could do a post just about Ray, or Scot, or a long one on Chad or Diane -- I think I'd have to do a series on Chad's mom. Instead I'll talk about them as a collective whole -- they're people. There are things to like about them all, there's plenty to dislike about them all (particularly the adults). A lot of what they do seem inconsistent with the characters as Rossmann has presented them, but that just makes them more human. There's not one character in this book that isn't a human -- no one larger than life (Scot kind of is, but he's larger than life in the way that we all know someone who seems to be that way). Any person in this book could easily be the person next to you in the bagel shop, sipping on their caffeinated beverage of choice. They're delightful in that perceived realism, also in the way that Rossmann talks about them. Without approval of anything, you get the feeling that she has affection for every character in the book. The clergymen who appeared -- however briefly -- in this book were a couple of the least objectionable depictions of clergy I can remember seeing lately. Not hypocritical, they actually seemed to believe in what they were saying, and were actually trying to help those they encountered. It's not often you get to see that anymore, and it should be acknowledged when you see it. I've been struggling for a few days -- and I'm not sure I'm succeeding at the moment -- to put into words the experience that is The Place You're Supposed to Laugh. I think I was hooked by the end of chapter 1 -- definitely by some point in the third chapter. I liked the book, I liked the characters, I liked the writing. It's a pleasant, thoughtful experience. It's what reading a book should be like -- skillful writing, wonderfully drawn characters and prose you enjoy immersing yourself in. The novel talks about a lot of things -- one of the biggest themes is forgiveness. I don't think I've ever seen the topic discussed in quite the same way in any format. I won't suggest that Rossmann exhausted the idea, obviously, but she talked about it, depicted it, and had her characters think about it in ways I found refreshing and encouraging. 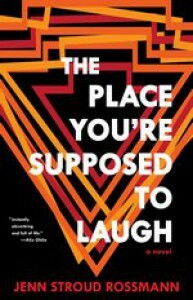 I'm not sure what else to say -- The Place You're Supposed to Laugh is a great read. It's a strong novel that will make you think, will make you feel, and will leave you satisfied. Rossman writes with sensitivity, wit and skill. What else are you looking for? Disclaimer: I was provided with a copy of this novel by the author in exchange for my honest opinion, which is seen above.